WASHINGTON (CNN) -- President Obama called Tuesday for the immediate and unconditional release of Myanmar opposition leader Aung San Suu Kyi, who is on trial for subversion. Obama said the Nobel Peace Prize winner's detention is "arbitrary" and "unjustified" in accordance with the findings of a United Nations group looking into the matter. "I strongly condemn her house arrest and detention, which have also been condemned around the world," Obama said in a statement. "Aung San Suu Kyi's continued detention, isolation and show trial, based on spurious charges, cast serious doubt on the Burmese regime's willingness to be a responsible member of the international community," he said. "This is an important opportunity for the government in Burma to demonstrate that it respects its own laws and its own people." Myanmar's military junta, which has ruled the country since 1962, changed the English translation of the country's name from Burma in 1989, but several governments, including the United States, still use the older name. Suu Kyi's U.S.-based lawyer, Jared Genser, said he was pleased the president weighed in so strongly. Genser said sustained U.S. engagement is vital to keep the international community engaged on the "threat to international peace and security posed by the ongoing actions of the Burmese junta." At a prison compound in Yangon, the Myanmar capital, Suu Kyi, 63, took the stand for the first time Tuesday and told a Myanmar court that she did not violate her house arrest when she offered temporary shelter to an American man who swam to her lakeside home. "She was very confident, very firm, very clear," said Mark Canning, the British ambassador to Myanmar, who was among diplomats and journalists allowed to watch the proceedings. "In a strange way, she commanded the courtroom," he said. Suu Kyi, who is being tried on subversion charges, said she did not learn immediately that John William Yettaw swam nearly two miles and snuck into her crumbling, colonial-era bungalow on May 3. She was told about the visitor the next day by one of two housekeepers who are her sole companions in the heavily guarded residence, where she was under house arrest. Suu Kyi's two helpers are also on trial, as is Yettaw. Yettaw left her home late May 5, she said. "He walked to the lakeside. 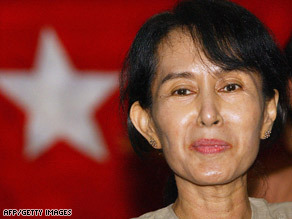 But I don't know which way he went, because it was very dark," Suu Kyi said. The Nobel laureate also acknowledged that Yettaw, a 53-year-old former military serviceman from Falcon, Missouri, visited her once before last November. "Did you report to the authority about his arrival?" the judge asked. Suu Kyi had earlier told supporters that she did not tell authorities about the latest intrusion because she didn't want Yettaw or anyone else to get in trouble. But it is her silence for which the Myanmar's military junta is trying her. The government said Yettaw's presence violated conditions of Suu Kyi's house arrest. If convicted, she could be sentenced to three to five years in prison. Suu Kyi has been held under house arrest since 1989. Suu Kyi has been under house arrest for 13 of the past 19 years -- a confinement the military junta has regularly extended. Her latest round of home detention, after five years of confinement, expires Wednesday, according to her supporters at home and abroad. The Nobel laureate has been the face of Myanmar's pro-democracy movement and the focus of a global campaign to free her. Though the government said it considered releasing her at the end of the term, it said it had no choice but to try her after she met with Yettaw. Obama called Suu Kyi a patriot who has sacrificed much for democracy. Her release, he said, would give the Myanmar government an opportunity to restore its global standing. Suu Kyi's National League for Democracy party won an overwhelming victory in 1990 in the first free elections in the country in nearly 30 years. But the military junta refused to step down and annulled the election results.